Check Out the new "Still Looking Pretty Good" page. It includes current photos of classmates getting together. Don't forget to take photos when you meet with other classmates and send them in, so they can be included on this new page. Hello! 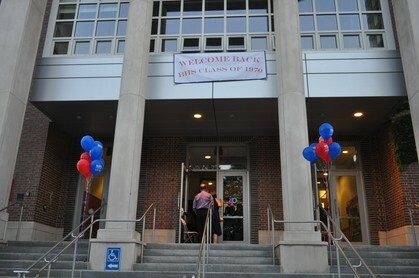 Welcome to the Brookline High, Packard House, Class of 1970 web site. This site is the place to find out information about old friends and the latest information about our classmates and all the Reunion information. Select your name in the box on the right and fill out a few simple questions. Note: This site is for the use of the Reunion Committee and classmates only. No information will be used for commercial purposes. See hundreds of photos from the 40th Reunion on the "Pictures from the 40th" page of the website. Play this video and see how many of these classmates you recognize.